Are you in the mood for daydreaming? 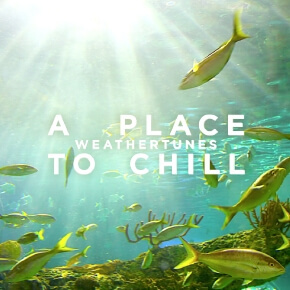 Simply accept Weathertunes’s invitation, press play and feel comfortably home at “A Place To Chill”. Like a golden glint on the horizon, 12 sonically rich tracks are awaiting you, which expertly navigate the smooth seas with a seamless interplay of acoustic instrumentation and soothing electronic beats. Over the past 17 years, Weathertunes – aka Lemongrassmusic brothers Roland Voss and Daniel Voss – has quietly whispered its way into the consciousness of those, searching out quality Chillout and Lounge music. Now the Germany based project is back with gorgeous mosaics of sound, always capable of bringing a sunny climate to any listening environment. Melodically composed with the finest of modern sound techniques and production skills, Weathertunes delivers bewitchingly beautiful, well tempered downtempo beats infused with great guitars, delicate piano sounds and a few jazzy vibes. There can’t be any better take-off as with “Natural High” and “Flower Fields”, providing instant access to musical heavens. By adeptly including tempting female vocals into their cinematic tapestries, tracks like the gorgeous “My Love” and “From The Sky” are as soft as velvet with their heart-melting tenderness. While “Road Trip” captivates with an irresistible groove, “Flying Birds” and “People Love” steer through warmer waters, bringing back beguiling summer magic. But Weathertunes’s most convincing quality is to stretch their talents over the full length of an album, surrounding you in a halo of light and positivity. The idea of creating a virtual space called “A Place To Chill” superbly succeeded, endowing the listener with a 60 minutes break of inner peace and relaxation, tremendously precious within our fast paced world.